The wealthy elite have always craved their privacy and strived to get out of the sight of not only normal people, but also the paparazzi which follows their every move. Surely there can be no better way of doing this than taking to the high seas which is just one of many reasons that so-called super yachts have become so popular in the last 20 years. In fact as social media has taken away privacy and bank balances have increased the number of these yachts in the world has increased exponentially. If you crave a life of solitude, with countless crew members on hand to cater to your every whim and wish, obviously then maybe this list of ours will give you something to aspire to. 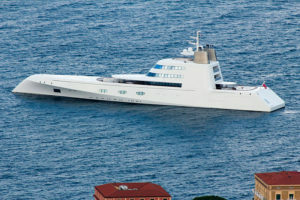 The cheapest yacht on our list the Seven Seas cost its owner Steven Spielberg a mere $200 million. It is extremely private only sleeping a maximum of 12 guests in 7 decadent suites including an owner’s cabin. For days when this simply isn’t quiet enough for Mr. Spielberg there is also an entire private owner’s deck set aside for his moments of solitude. 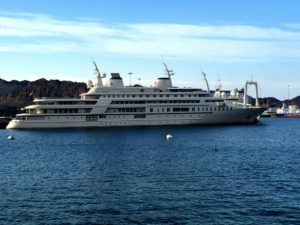 The yacht also has a helipad, gymnasium, infinity pool and movie theatre. Built by Blohm and Voss shipyards for the Saudi Arabian businessman Nasser Al-Rashid if the sheer size (it is 334 feet long) doesn’t spell it out clearly for you that this is a luxury yacht then the 24 karat gold lettering and embellishments leave little room for doubt. This yacht has a swimming pool (with a retractable roof for those who want to soak up the rays), helipad and a 75ft Viscount Linley dining room table where you could host spectacular banquets if you had enough friends to fill it. There is also the super cool (in our opinion) sand-covered hydraulic platform with real sand, deck chairs and palm trees which can be adjusted to sit on the water line. This boat literally carries its own private beach with it wherever it goes. Built by Peters Schiffbau Wewelsfleth for the Prime Minister & Foreign Minister of Qatar, this luxurious yacht features 10 suites each with an ensuite living room and double bedroom as well as 2 VIP owners rooms as well as 55 rooms to house crew members. It comes with all the usual (if you are a billionaire that is) amenities, such as an on-board cinema, sun deck, pool and helipad. There are also outdoor Jacuzzis and a wide range of watersports available. This yacht was completed in 2008 for the Russian oligarch (and part owner of Arsenal Football Club) Alisher Usmanov who named the ship for his dead mother. 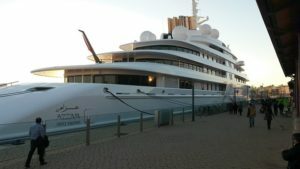 This is one of the largest yachts in the world coming in at 360.89ft and is used to visit the owner’s many private islands, how else could possibly be expected to get there? 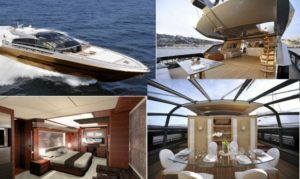 This yacht comes with the prerequisite swimming pools and a helipad as well as space for 48 crew members and 70 of your nearest and dearest. 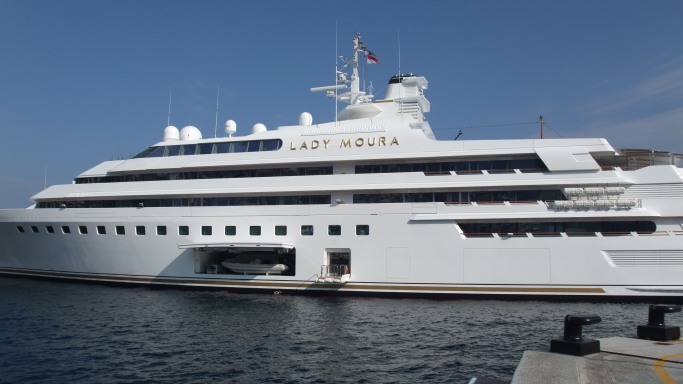 This yacht is named after its owner Qaboos Bin Said, the Sultan of Oman and at the time of its completion was the second largest in the world, now the third largest. 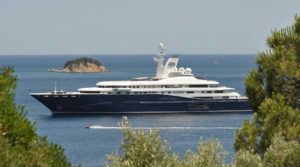 It can opulently cater to 70 guests, with it’s 154 crew members, and is one of the most private yachts on our list. Unfortunately with no photos of the interior existing it is hard for us to describe it to you but I think it is safe to say that it is decadent as is evidenced by the fact that all we really know for sure about it is that it has it’s very own concert hall…..and that it cost a cool $300 million. Owned by the Russian oligarch Andrey Melnichenko and his wife Aleksandra, this yacht might not have the most unique name in the world but maybe the name was left generic to add emphasis to how special the design is. Built to resemble a stealth warship or submarine this luxury yacht must be the only of its kind in the world. It is also massive. The interior measure more than 24,000 square feet including a mammoth 2500 square foot master bedroom and guest suites which can be turned into 4 much larger staterooms. It also comes with the ‘standard’ helicopter hanger, a 30 ft speed and three swimming pools (one of which has a glass bottom and is located directly above the on-board disco). Adding to the opulence is the fact that all the furniture, glassware and tableware on the ship are made with French crystal. This yacht was commissioned by Prince Jefri Bolkiah of Brunei 10 years prior to its launch in 2006 before eventually being bought by Platinum Yachts for Sheikh Mohammed Rashid Al-Maktoum, the ruler of Dubai, any guesses where the name came from? It has several Jacuzzis and a swimming pool which is elaborately finished with handmade tiles as well as beautifully created mosaics throughout the interior and the must have helipad. One of the coolest features by far however, to us at least, is the spectacular circular staircase with glass steps that change colour with the light that comes through the top deck. 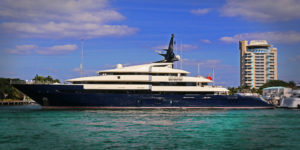 This yacht is owned by Sheikh Khalifa Bin Zayed al-Nahyan, President of the United Arab Emirates and Emir of Abu Dhabi. It is 590 ft long making it the largest private yacht in the world with a luxury interior designed by the world-renowned French interior designer Christophe Leoni in what has been described as a ‘sophisticated and luxurious in a turn of the century Empire style’. There really isn’t much known about this yacht so we can only speculate as to its features. Similarly it is also fun to speculate for how much longer it will hold its crown as the largest yacht in the world. 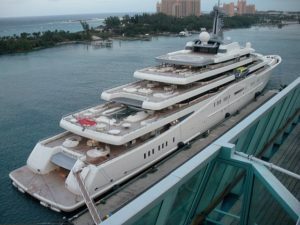 Owned by the same Russian billionaire who owns Chelsea Football club, Roman Abramovich and measuring 536 feet this yacht is both the second largest and second most expensive in the world. Its immense size allows it to have many conveniences which could easily be described as hedonistic. These features include two swimming pools, several hot tubs, a disco hall, two helipads (because one clearly wouldn’t be sufficient), three launch boats and a mini-submarine which can go down as deep as 50 metres. It is also extremely well protected with intruder detection mechanisms, a missile defense system, armour plating and bulletproof windows. 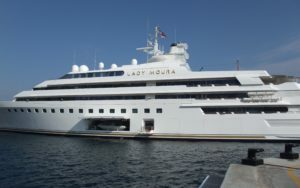 It also takes privacy to a whole new level with a unique paparazzi shield consisting of lasers which sweep the area around the yacht which shine a light directly into the lense of any camera they might detect preventing a photograph being taken. This yacht has 24 cabins and requires at least 70 crew members to maintain its extravagance. 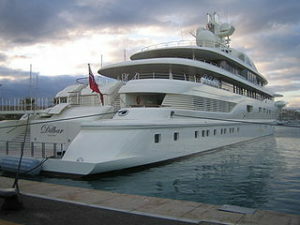 Measuring a ‘mere’ 100 feet long this is the smallest and most expensive yacht on our list. It took in excess of three years to build and was eventually purchased by an unknown Malaysian businessman. What makes this boat so expensive in spite of its relatively small size is the fact that a staggering 100,000 kg of gold and platinum were used in its assembly; it coats the decks, railings, staircases and anchor to name just a few places. It also has a wall feature made from meteorite rock and a statue made from genuine Tyrannosaurus Rex bones, talk about showing people how rich you are! Everything on this boat is decadent right down to the iPhone it comes with which is wrapped in 500 cut diamonds and the bottle of liquor featuring a diamond worth $45 million alone!